What a great way to use up those little bits of ever increasing scraps to great advantage. Super mixed media card. 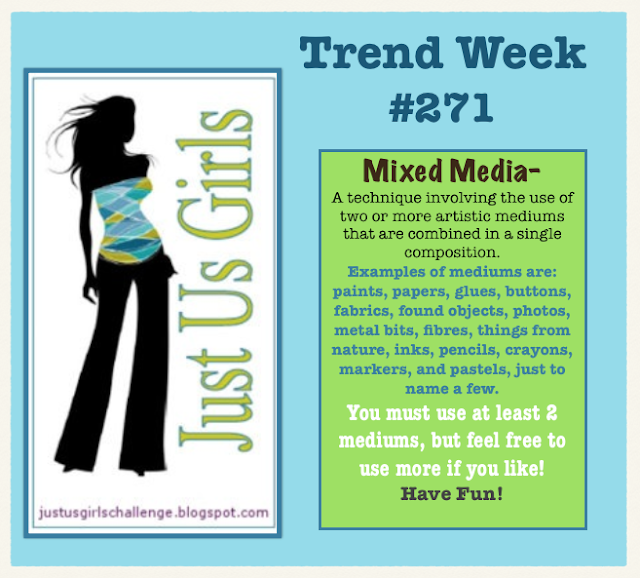 Thanks for joining us this week at Just us Girls. Amazing! This just screams mixed media. I love all of the patterns. Thanks for playing with us at JUGS! Hey Shirley! Love your MM card as always! What a great gift from your family! Thanks for sharing your talents with us at Just Us Girls and Merry Christmas! super cool! Love the collage! Thanks for playing along with Just Us Girls this week! ok...this is one super cool card...you are sooooo creative! !